Cromarty harbour I'd guess at about 1910 with what looks like the Osbourne in the background. The brig is the Bonnie Lass under Captain Maclean. Thanks John - as she appears in quite a few pictures of the harbour at that time, could you give us some more information about her? The Bonnie Lass was my Great Grandfather's. She was sunk in the North Sea after a collision with another vessel whose Captain and crew were drunk! Before Captain MacLean took over the 'Bonnie Lass' she was owned by my grandfather James Bain who worked her in the Baltic trade. Is she not a topsail schooner? He later skippered the 'Saga' - the Cromarty-Invergordon steam ferry which I'm pretty sure appears in the foreground of this picture. He was drowned in the harbour 26 October 1913. His grandfather, also James Bain of Nigg[d.1842], was known as 'the Ross ferryman'. Can you please tell me when she was sunk and who at the time was sailing on her? Wreck of the Bonny Lass schooner. Steam trawler Sunshine of Aberdeen collided with the Bonny Lass at night off Rattray Head, as she was on route to Cromarty with a cargo of coal. A member of the crew, William Lochrin (22), was thrown from the jib boom, where he was setting a sail, onto the deck of the trawler which continued without offering assistance. Lochrin was landed at Fraserburgh. Two days later the steam trawler Connisburgh Castle came to the aid of the Bonny Lass, where the crew had been pumping since the collision and were exhausted. The crew were taken off and the ship left to sink. 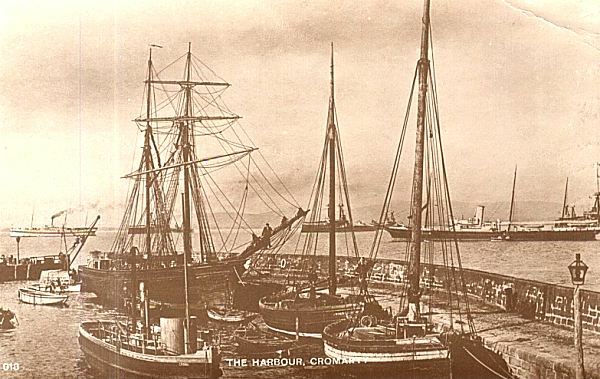 The crew, from Cromarty and Portmahomack, with one Russian, were landed at Grimsby. The Sunshine later arrived at Aberdeen, claiming that they did not think the schooner had been damaged. A successful claim for damages was pursued by the captain/owner, Captain Maclean, in the court of Session (Invergordon Times 26th July 1906). I'm interested in this story because I'm a descendant of the ship's owner, Capt Maclean. There is a model of the Bonnie Lass at www(dot)scran.ac.uk [search for bonnie lass wick]. The sinking is recounted by a Mr James Hogg in a 1960s audio recording at www(dot)ambaile.org.uk [see "Memories of Cromarty and its Fishing Boats (5 of 12)"]. Mr Hogg stated that Capt Maclean later acquired another schooner, the "Lily". Does anyone have any information about that ship?